Honoring the Best Nurses in the Business! May 6-12 is National Nurses Week, and Generations Healthcare Network is taking this opportunity to send the largest “Thank you” we can to each member of our nursing force. Generations brings in registered nurses, licensed professional nurses and certified nursing assistants from across the United States and around the globe, and every one of them fills a vital need. In the Chicago suburb of Niles, on the fourth floor of Generations at Regency, the need that faces licensed nurse Kathy Corte is simple: a resident would like help putting her wrap on. Kathy obliges, but works a shoulders- and arms-warming hug into the resident’s request. In a single motion, Kathy just fulfilled both of the pursuits that brought her into nursing. Throughout the 11 facilities of the Generations family — and truly, throughout the world — nurses evaluate and administer the individual medical needs of each resident, from checking blood pressure to sorting out pills. Nurses like Kathy, though, also take emotional health as one of their responsibilities, knowing that a happy heart leads to a speedier recovery. 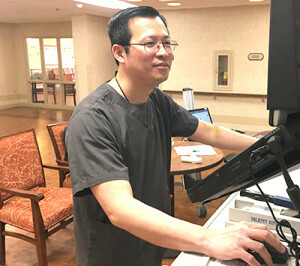 Registered nurse Ferrer Go believes in the same approach with the Generations at Oakton Pavilion residents he serves. Ferrer expected to become a teacher, but chose nursing instead when he saw the connection he could make with people. 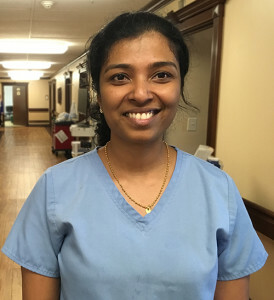 The chance to make an impact with a large group of people is what captured the attention of registered nurse Anju Satheesh, who works alongside Kathy at Regency. She said she planned to get into health care since her childhood. Back on Regency’s fourth floor, Kathy could use a little support herself. She is nearing the end of her shift and has been on her feet, moving around the whole day — yes, giving smiles and hugs, but helping move people and things as well. Nursing is a job of love and compassion, but it is a job of physical exertion as well, and even in Regency’s cool hallway, Kathy is feeling warm. “I’m almost sweating,” Kathy said to her. But this woman has known Kathy for a while, and been hugged by her a few times before. After National Nurses Week has passed for another year, the two will surely hug a few more times again.